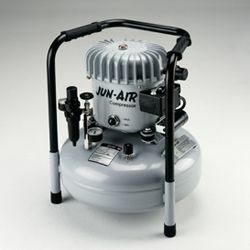 The Jun-Air Model 6 range is a mainstay of many a laboratory and scientific establishment. The Jun-Air 6-15; the 15 litre version (1313000) delivers an impressive 32-37 l/m at 8 bar. With negligible noise levels it's a pleasure to work alongside.